Austria-Hungary declares war on Russia at 1200 hours. Austrian Lt Pokorny solves first Russian cryptogram of war. Letter from German Chief of Staff Moltke to von Austrians Hötzendorf: ‘Italy’s felony will be revenged in history. May God grant you victory now, so that you will be able to settle accounts later with these knaves’. The government of this Balkan state, which has close links with Serbia, declares war on Austria-Hungary. Her 50,000 militia and a few guns tie down 3 Austrian mountain brigades. German troops launch a night attack on Liege but fail to capture any of the outer ring of 12 powerful forts protecting the city, which is the key border defense in eastern Belgium and a railroad center. It also blocks the route of the German First and Second Armies as they attempt to head for the French border before swinging south toward Paris as part of the Schlieffen Plan, the German war strategy. 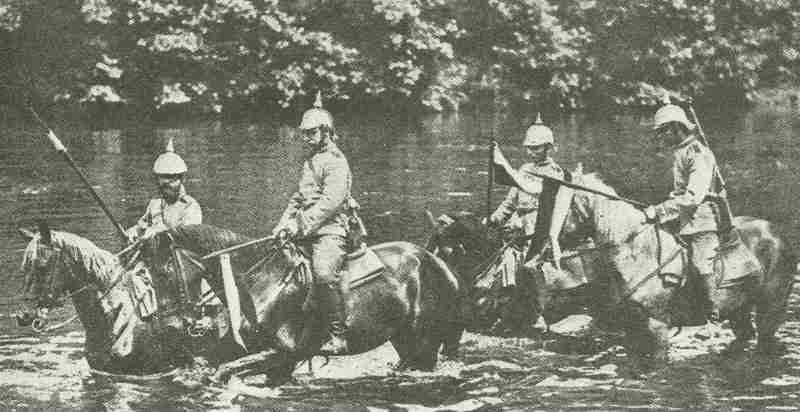 German cavalry patrols reach Namur. German Cuirassiers patrol in East Prussia. Russo-German cavalry skirmish at Soldau. Enver offers Russian Ambassador an alliance for Balkan concessions, latter told to gain time only. Enver also forms Special Organiza­tion to promote guerrilla risings in Libya, Macedonia, Persia and the Caucasus. Catholics of Etchmiadzin writes to Russian Caucasus Governeur-General Vorontsov offering loyalty of Armenians in Turkey (Vorontsov replies 2 September hoping they will obey his instructions). German East Africa learns war has broken out from Kamina radio, Togo. British form East Africa Mounted Rifles (-May 1917) and CID sub-ctee for opera­tions outside Europe. German auxiliary minelayer ‘Königin Luise’ sunk by 2 British destroyers of Harwich Force, 50 miles off Suffolk coast. British cruiser ‘Amphion’ (151 men lost) sunk by 2 of the 180 mines. Heligoland Patrol of British submarines instituted. Five German overseas submarine cables (including Emden-Vigo­-Azores) cut by British cableship ‘Telconia’. 2 light cruisers building for Russia at Danzig, Germany, requisitioned (‘Elbing’ completed 14 December, ‘Pillau’ launched 21 November). Cuba, Uruguay, Mexico, Argentina and Chile declare neutrality. President Wilson offers mediation. Neutrality censor put in all radio stations. US­-Nicaragua (Bryan-Chamorro) Treaty gives former Pacific and Atlantic naval bases and the right to build Panama canal for $ 3 millions. MI5 and police arrest all 21 known German spies (7 in London) and 200 suspects (first of 32,000 wartime internees). KITCH­ENER MADE WAR MINISTER as about to leave Dover for Egypt. Irish Nationalist Party leader Redmond backs war in Commons, troops can be withdrawn.